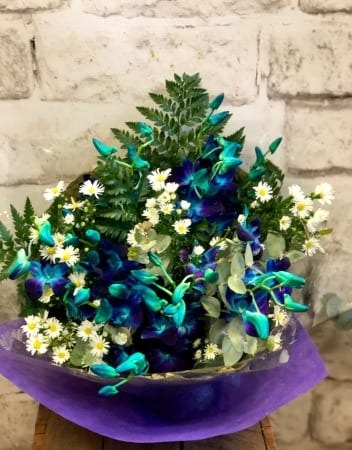 A stunning bouquet of blue singapore orchids, mixed with leather fern. The long lasting singapore orchid can be re-energised to keep it looking fresh and new for weeks. Singapore orchids come in a variety of colours (white, green, blue and purple) and are a popular choice for Easter, Mothers Day, Birthdays, Sympathy, Anniversaries, and just to say "I Love You". Select your colour preference above. Created by Amaranthine Flowers By Design, Newcastle and delivered in a convenient temporary vase. Same day delivery available, six days a week, to all areas of Newcastle and Lake Macquarie, including John Hunter Hospital, Newcastle Private Hospital, Lake Macquarie Private Hospital, and Mater Hospital.